If you've already set up a contact list or distribution list or two in Microsoft Outlook, you may want to import the email list into WordJot. After a lot of searching around we've found the way, and it's not too difficult. Before we get started, you might like to check your categories are set up, and if needed match your Outlook distribution lists. Here's how to import your contacts from Outlook, note the instructions and images here are from Outlook 2003. Find your contact list in Outlook and double click it to open it up. From the "File" menu choose "Save As..."
Save the list somewhere handy, for example your desktop. Set the save format as "Rich Text Format" or "Plain Text"
Find the file and double click it to view the contents. This should open up your mailing list in either Word or Notepad. Select the emails and copy them to the clipboard. Click on "Batch Import/Delete" from the side menu. 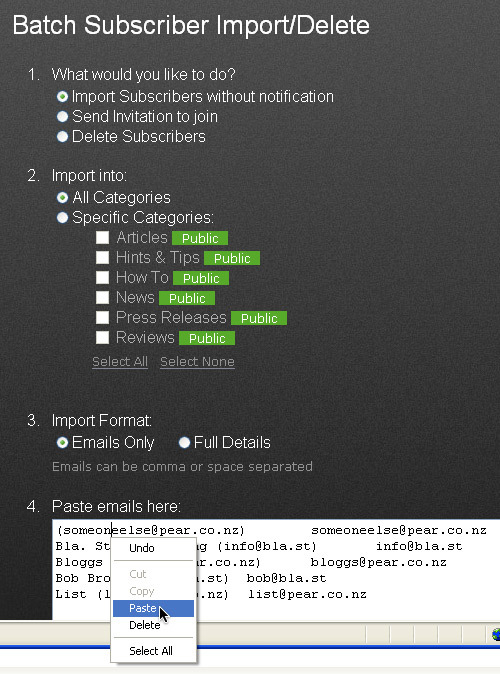 Select which categories to import this list into, and paste the emails into the WordJot import panel. Check the other options on the import page are correct and then click "Import", and then confirm the import. Don't worry about duplicates, WordJot will only import each address once. Don't worry about irrelevant text around the emails, WordJot will find the email addresses and ignore the rest. If the user is already subscribed to your newsletter, they'll simply be added to any extra categories you've chosen. First thanks to everyone who has tried out WordJot recently, we've received some great feedback that has been very useful. There will be more stuff coming soon, in the meantime any suggestions or requests would be welcome. We were asked today if it's possible to add more links to the side menu. We haven't added that functionality yet, but a good alternative is to create a dedicated links page and put it in the side menu. Create a post like normal and call it "Links". You can then add links and arrange the page as you wish. Be sure to check the "Show permanently in the side menu" in the advanced options. That's it, and where ever the side menu is displayed it will list your links page. This technique is also good for "About Us" or "Contact" pages. HAMILTON, NEW ZEALAND - 26th March, 2008 - Pear Software today announces the launch of the WordJot Newsletters, an online service that enables organisations to publish news onto the web, and direct to subscribers via email and RSS feeds. WordJot was created primarily for small and medium sized businesses and organisations who need to send out newsletters, news, articles and other information to members, clients, customers or staff. Director and founder Tim Bromhead says WordJot is similar in style to blogging software, which makes it easy to publish information and news quickly onto the web. "Where WordJot stands apart is with its email sending capabilities, which allows users to subscribe and unsubscribe themselves to your newsletter with ease" says Mr Bromhead. "Most blogging systems do not include email sending functionality by default, so WordJot is well suited for organisations who may already have an email based mailing list". WordJot helps businesses comply with the recently introduced New Zealand anti-spam legislation, with easy one click unsubscribe capability and the ability to easily identify who emails come from. The system also supports categories allowing news and messages to target a specific group of users, for example staff, but not customers. Comments can also be left on posts, creating a quick and easy way to receive feedback from customers. Pear Software is initially promoting WordJot to New Zealand businesses, but international customers will also be able to use the system. "We think there's huge potential to sell Internet services like WordJot to a worldwide audience. With services like PayPal it's easy for New Zealand businesses to automatically accept credit card payments from international users." explains Mr Bromhead. Pear Software (www.pear.co.nz) is a Hamilton based web development company founded in 1993 by Tim Bromhead. Services provided by Pear include WordJot Newsletters, PowerSite website building system, and the Bla.st advertising network and directory. There are heaps of features we will be adding over time, in the meantime anyone is welcome to create a free demo newsletter which allows up to 3 items to be posted.